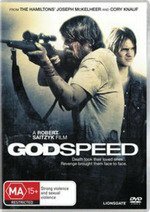 Godspeed is a sophisticated film about unsophisticated people. I could not shake the milieu of rural Alaska we have come to know so well through the ambitious ego of its former governor, Sarah Palin. There be guns, bibles and mountains. The opening is populated by desperate people of faith with varying maladies hoping for some kind of salvation from “God’s healer” Charlie Shepard (a very rugged Joseph McKelheer). However, Shepard’s home-life is anything but idyllic. There is tension with his wife and they must raise their son. His murky past is the source of whispers in town but it is overlooked for the miracle of his healing hands: he takes illness out of the bodies of the sick at his congregation. However, what if Shepard ever fails to heal someone? What if he ends up making someone worse and killing them? And what if this version of events is all in someone’s head? Shepard cannot escape blame in the eyes of relatives left behind. One particularly angry young man, Luke Roberts (Cory Knauf is angular, brisk, lithe and menacing), really misses his mother. When Shepard’s life darkens and he no longer heals at church, an attractive young woman (Courtney Halverson) turns up, seduces him and semi-wittingly woos him on a pretext down a filthy path of revenge. I really do not want to divulge any more but the plot has a nice, natural circularity about it. I liked the tight control placed on the scenes by director Robert Saitzyk. There are many stunning external shots but also close, uncomfortable, static interiors. There are also disturbing tendencies toward “love in the family”. There is a luscious gothic glaze hanging from the icy-peaks which is fittingly chilling. Godspeed is taut, gripping viewing from which you hate to turn away. The special features include a four-minute behind-the-scene clip, as well as three deleted scenes with or without director’s commentary: these help illustrate just how judiciously the filmmakers cut the fat. I’d highly recommended this far-North American morality tale to almost everyone. It’s not a gore-fest but more an intelligent, unsettling suspense drama.